Did you have a chance to read last Friday’s blog post about ancient medical manuscripts (Ancient Medical Guidance)? 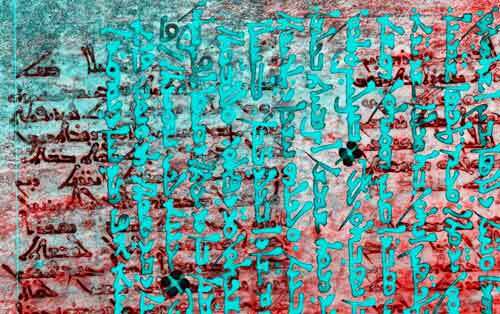 There was another manuscript of that ilk in the news recently; a Syriac scholar from Germany’s Philipps University found pages that had been missing from the manuscript. The article was certainly interesting, but what grabbed my attention was that the manuscript was a palimpsest--older writing on its parchment pages had been scraped away and replaced with newer writing. An 11th century liturgical book of Syriac Christian hymns overwrote what was likely a 9th century copy of the 6th century Syriac translation of Galen’s On Simple Drugs. Strip of Syriac Galen Palimpsest. If you’re starting where I did, a little background will help. An 11 book treatise, On the Mixtures and Powers of Simple Drugs, by Galen of Pergamon, the Greek physician, surgeon and philosopher who died in 200 AD, was translated into many languages and influenced generations of practitioners and patients. The first five books of the treatise addressed the theory of how drugs work; books 6 through 11 provided an alphabetical list of drugs and possible uses. Although most if not all of the work was translated into Syriac, a dialect of Middle Aramaic, an ancestor of Arabic and Hebrew, it was thought that the only remaining example of a Syriac translation was the British Library’s copy of books 6 through 8. That thought changed in 2009 when the underlying text of the palimpsest was identified. That the 11th century hymn book was a palimpsest and that the underlying text was a 9th century medical text was known in 1922; the book was described in a catalog of manuscripts offered for sale. The buyer was a Swiss industrialist, whose heirs offered the book for sale at auction in New York in 1948. The book didn’t show up again until 2002, when purchased by an anonymous collector in a private sale, and then in 2009, when the collector sent the book to the Walters Art Museum in Baltimore, Md., for conservation and digital imaging to enhance the underlying text. The initial imaging facilitated identification of the medical text as part of a Syriac translation of Galen’s book 8. The bound palimpsest was subsequently disassembled, digitized and spectrally enhanced in ways my former colleague would include in his digital image processing course. Which brings me back to the missing pages, seven in all. As recounted in a New York Times article, when the Philipps University researcher, who had studied the digital images online, was examining the book in the owner’s library in 2013, he realized that he had seen a page from the book at a Harvard University library. He subsequently tracked down five other missing pages--one from Sacred and Imperial Monastery of the God-Trodden Mount of Sinai (also known as St. Catherine’s in the Sinai Desert in Egypt), one from the National Library of France, and three from the Vatican library. From the context, the seventh missing page was presumed to have been blank and discarded. 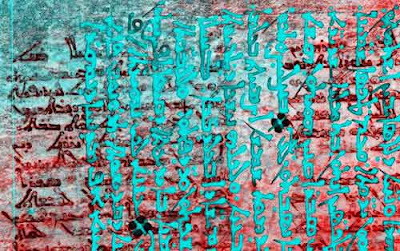 The retrieved pages were digitized and enhanced and the Digital Galen Syriac Palimpsest is available online as are examples from the progression of digitally enhanced pages. All is being studied by Syriac scholars to determine the content and compare it to copies written centuries earlier in Greek. It’s quite possible that the manuscript offers more of the 11 book treatise than the British Library’s books 6 through 8. Words from books 2 and 4 were found in the missing pages.